It is odd how intuition plays big part in high-altitude mountaineering for me. Success is much about timing but for most time on the mountain I don’t even think about the summit. Rotations are just about mechanically getting everything in place and making sure of adequate acclimatizing. Then one day I usually seem to get a sensation, a strangely subconscious-like and yet comforting and emphasized feel that the time is now. I pick a day to start looking at. This is where modern technology comes along to play part. This time the day I picked was July 27th whereas most teams where planning for 26th. I am glad to have found a weather forecast professional who is in great understanding what factors a mountaineer needs to look at. Deciding between these two days I had a feeling that 27th would be my day. Not just by the numbers provided in the forecast but given the feel I had, the sensation. Climbers often forget that what they are looking at when they look at forecasts is an expectation what might be happening on that given day. It is after all big-mountain nature we are dealing with here and we for sure don’t know what’s going to happen ’til we’re there. Some weather-professionals though seem to often know better than others. I was left alone at basecamp as all teams started their 5-day summit-push on 22th. I was to follow in two days as I aimed for the later day as well as I was skipping Camp 1 to make the push a day shorter. Was I making a mistake here and missing my change? On 24th I left K2 basecamp for the last time. On a big peak you in reality only get one shot. In a couple days time all this would be over and I would be heading home, with or without summit. Fail, and you need several days rest before you are even able to go up again and most likely you in that case would not get another weather-window. I always like to move early in the morning to benefit of firm snow-conditions before heat of day turns everything to slush. I climbed to my Camp 2 below House’s Chimney (6650m.). Following day I climbed the long and difficult section to overcome the so called Black Pyramid and reach Camp 3. 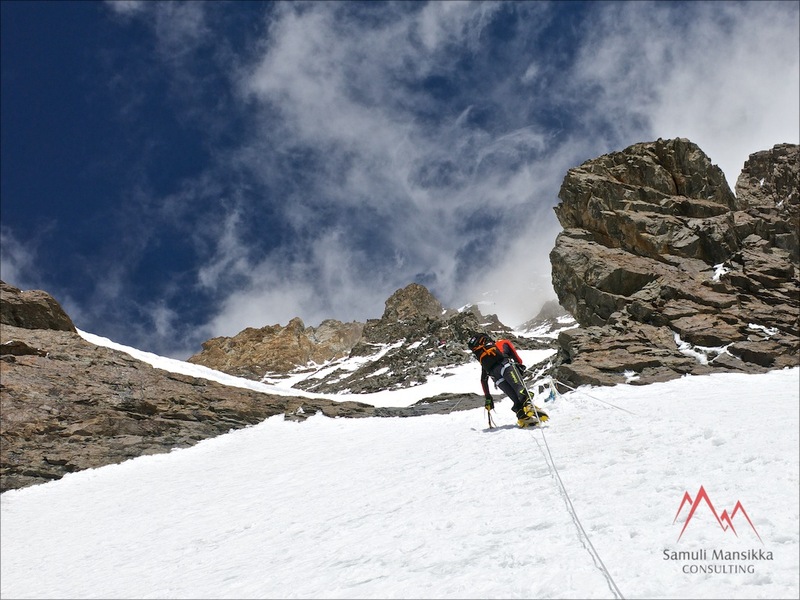 Camp 3 is set on a shoulder-like feature at 7450 meters at where style of climbing changes. Now you have made the mixed, rocky terrain of Abruzzi-ridge and are entering a World of deep snow and ice. At camp 3 I dug a platform, set up my lightweight summit-assault tent, tucked in and started my regular cycle of self-maintaining routines; melt snow, fill water-containers, prepare food, check what’s taken up next day, make tea, snack…repeat, avoid any extra effort and sleep. On morning of 26th I packed down my camp and climbed across the snowfields towards the Shoulder and Camp 4, the highest campsite at 7950m. The day before summit-push is big effort as you are carrying full set of camping gear as well as your summit-gear (given you are not sherpa-supported). I thought this section was eventually easier than I had anticipated and I quickly reached the flat Shoulder-area. I got my camp quickly set-up and started my routines. All remaining day I was looking at the first wave of people climbing to the summit. Close to 30 people climbed slowly to the summit the first climber reaching it only after 1pm. It would take several more hours ’til everyone would follow and start down. They would not make it back to camp in daylight. Luckily we were saved from trouble and rescues. I decided to start my push after 9pm. At the time I heard teams arriving at camp so slowly I got myself ready and started only after 9:30pm. It was just me, the three Americans, their three sherpa and Mingma Sherpa’s international team of 6 who had decided for 27th. I started well before the others and headed to darkness. After leaving camp you are aiming directly towards the bottleneck, a snow-ramp between steep rocky outcrops and underneath a gigantic hanging glacier. This is the single most dangerous section of the whole climb. It was dark and my field of observation was only limited to within reach of my headlight. I was trying to move as fast as I could; two breaths and a step, two breaths and a step.. I made good progress and far below I saw lights following but not reaching. I reached the base of seracs where you traverse left step by step getting out of the most obvious fall-line in case the thing would break. Occasionally my light hit the hanging glaciers above me. This thing was massive and I was glad I did not completely see underneath what I was climbing. I could only try to climb as fast as I could and hope it would stay stable. Changes of the serac collapsing the very moment I was there for those few hours were smaller than it staying put but if it would, the outcome would be obvious. I got out of the fall-line and knew I had now already made it to 8300 meters. ”Get this done now, and you will never need to return here”, I thought. It still was completely dark and I was climbing towards summit. After Bottleneck-traverse you climb straight up at a fairly steep angle (35-40 degrees). The higher I got, the deeper and softer snow also got. Sun was starting to light the horizon and eventually rose above it. At 8500 meters I started feeling the altitude and fatigue followed by breaking trail through all night. I let the American team pass. From Camp 4 K2 summit looks flat and we were arriving to right-hand edge of this seemingly flat top. Angle started to ease out and the Americans, breathing oxygen got away. The closer to top you get, the more obvious it becomes that the highest point is at the other end. Now I no longer had to crawl on my all fours. I was very close to the real summit and I finally knew I was going to make it all the way. Day was beautiful – no wind, no clouds. I could see everywhere around me – to Godwin-Austin glacier, to China, to nearby Broad Peak and to further Gasherbrums and hundreds of other mountains. I forgot the fatigue. I was warm and feeling good as I speed up to highest point where the American already were taking pictures. Last steps I cruised like on any lower-altitude peak and soon the whole massive mountain was below my feet. I could not believe what had happened. During whole climb I was so focused and concentrated that it only now crystalized to me that it was K2 I had climbed! It just happened! It truly was a magnificent day. Made a call home, took a few pictures and just sat there feeling confused of being there. It was only 8:15am. I have been on high summits without oxygen before and know how harmful it can be. It is crucial for one’s survival to keep in mind that the sooner you get down, the better. Hypoxia hits you especially hard on descent after some time spent on the summit. I started down after the Americans, climbed down carefully and arrived at Camp 4 right after noon. I crashed in my tent for a nap but knew I should not stay there overnight after having climbed that high. In the late afternoon I continued down to Camp 3 and next day (which happened to be my birthday) the remaining way to base of the route and on to basecamp. Only once at Advanced Basecamp at foot of Abruzzi-ridge I thought I was safe and had survived. I left basecamp on July 31st reaching Askole on August 3rd. Since then it’s been a freakin’ pain to get on with my journey home. A landslide blocked Askole-Skardu road, a truck-accident a section from Skardu to Chilas. Third day it just for the sake of it took 14 bumpy hours to reach Islamabad in where I pretty much directly got taken to the airport. This blog-entry I am writing in Ankara, Turkey where we landed due to engine-failure occurring on Doha-Copenhagen flight. Am I ready to go home? Hell yes I am! Thank you all for following my K2 climb! Please do stay tuned on Twitter and Instagram! Photos will be added soon at ’Previous trips’. Thanks to my partners: Valandre, Skyr, Rab / Heaven Distribution / Camu, LaSportiva / Outdoor Action Finland! 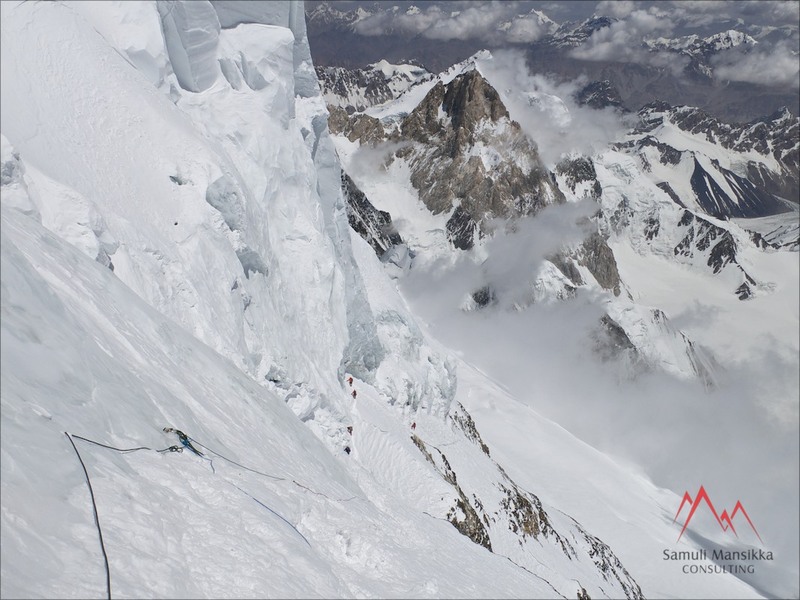 Until now I have completed my necessary acclimatizing and rotations on K2’s Abruzzi Ridge and I hear teams are starting to look at suitable summit dates according to their forecasts. I have spent a night at Camp 3 (7450m) at highest which should give me adequate acclimatizing for attempt on the peak’s 8611-meter summit. I of course had slight doubts about switching over from Broad Peak. K2 is notorious for being one of the World’s most dangerous mountains if not the most so. 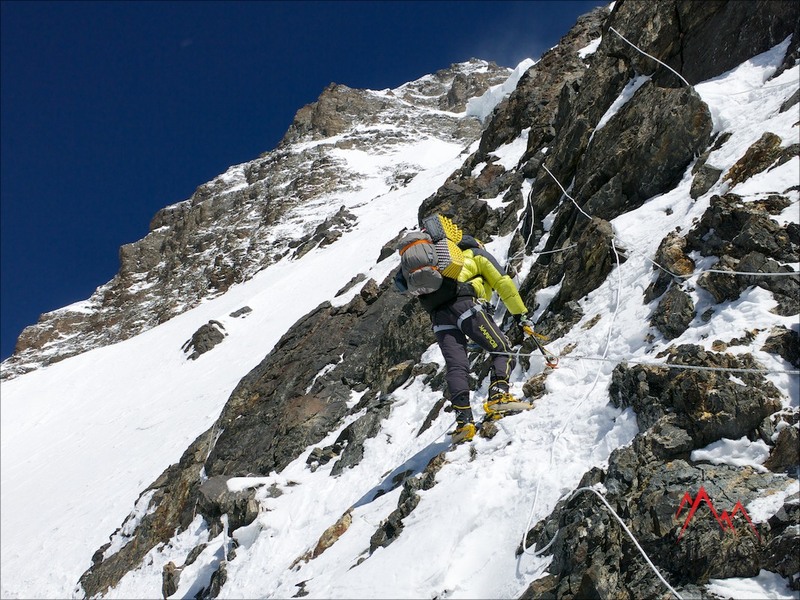 Avalanches, rockfalls and sudden storms have taken toll on climbers attempting the peak over it’s history. When compare the number of casualties related to number of summits this certainly is one of the most dangerous places on this planet. I did not feel comfortable on the mountain as I arrived at it’s base on July 5th. On my two rotations up to highcamps I started to get a feel of the mountain. Apparently the conditions are fairly good this year and my take on the mountain has altered. All the time I have the awareness brought by knowledge over the numerous accidents they’ve had here but still, I have in fact felt safe and comfortable. There’s been no avalanches on or close to route. I have not seen many rockfalls and also I have been able to quickly retreat from the mountain if the weather’s started to turn worse. In a way I have greatly enjoyed climbing the ”mountain of mountains”. The abruzzi Ridge differs greatly from all the other 8000’ers normal routes. It is steep, mixed, rocky, complex and offers fine and enjoyable climbing in places. The crux pitches of House’s Chimney and the Black Pyramid are World’s mountaineering classics. 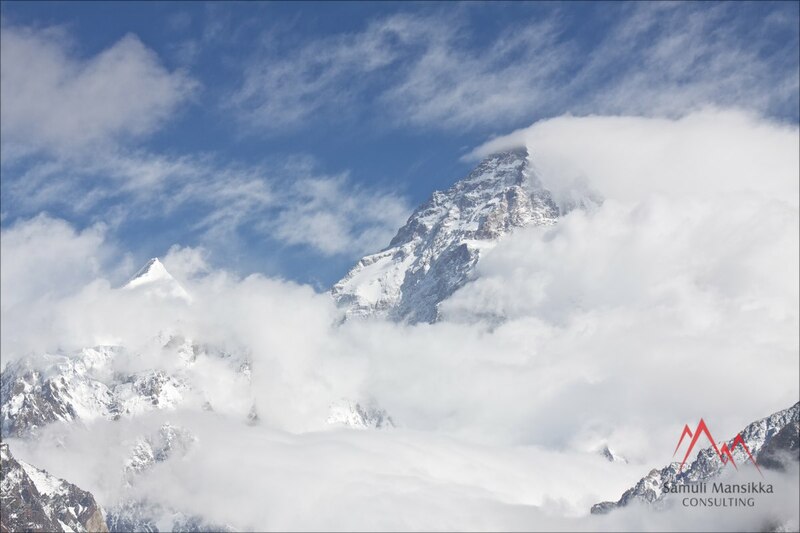 Highcamps are stunning giving splendid views over Concordia and Godwin-Austin glaciers. Close to Camp 3 (7450m.) you move to a different terrain as the ridge slightly flattens and widens out to form the Shoulder. Here you have views North to China as well as to many more peaks including the Gasherbrums. I have one more rotation to go to reach for the top. After a long period of heavy snowfall weather today started to get much better. I hear teams are starting to look at summit dates after 25th or 26th. This means I would tag along and hopefully start my summit attempt very soon. I did not set up Camp 1 (6200m.) but will climb direct from Basecamp (5200m.) to my Camp 2 which I set up at 6700m below House’s Chimney. 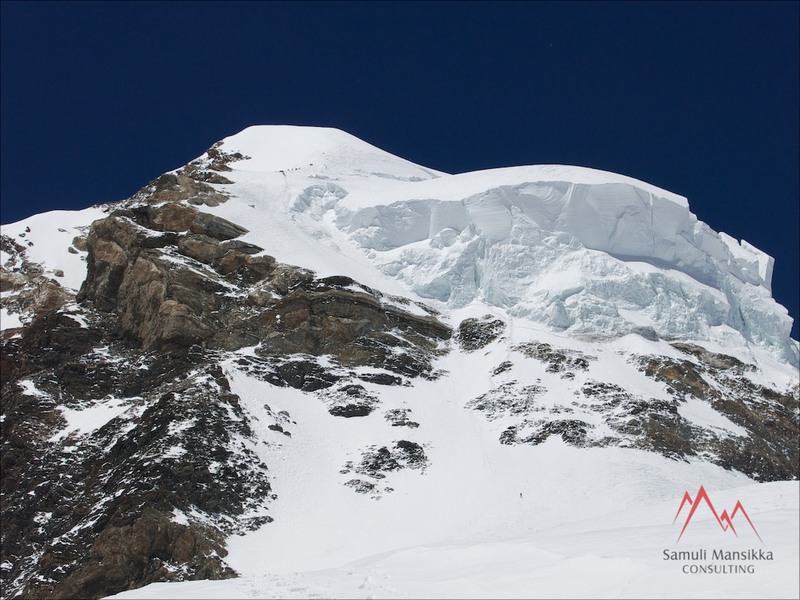 Next stage is to Camp 3 at 7450m from where it is a short, but strenuous climb to Shoulder at 7950m. 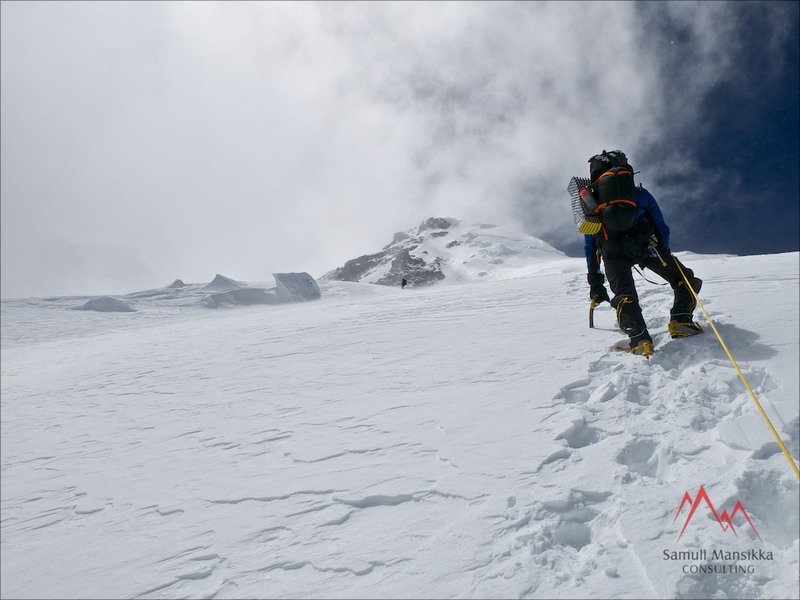 Climb to Camp 4 is what I expect to be the hardest as I will be carrying a complete camping set-up as well as all the summit-gear and do that at extreme altitude with very little oxygen in the air. From Camp 4 the summit-push is started late in the evening. First sections goes over a vast snowfield to base of so called ”bottleneck-couloir”. This can be considered as the single most dangerous part of the whole climb as you are climbing up a narrow funnel with a massive hanging glacier looming above. One can only hope the glacier sticks there solid long enough for you to climb the couloir and finally get aside at the ”bottleneck traverse”. After ”bottleneck traverse” you climb the steep snow slopes up towards the summit and hopefully, reach it in the morning. During my summit attempt I will be sending daily tweets at twitter.com/Samuli_Mansikka ! 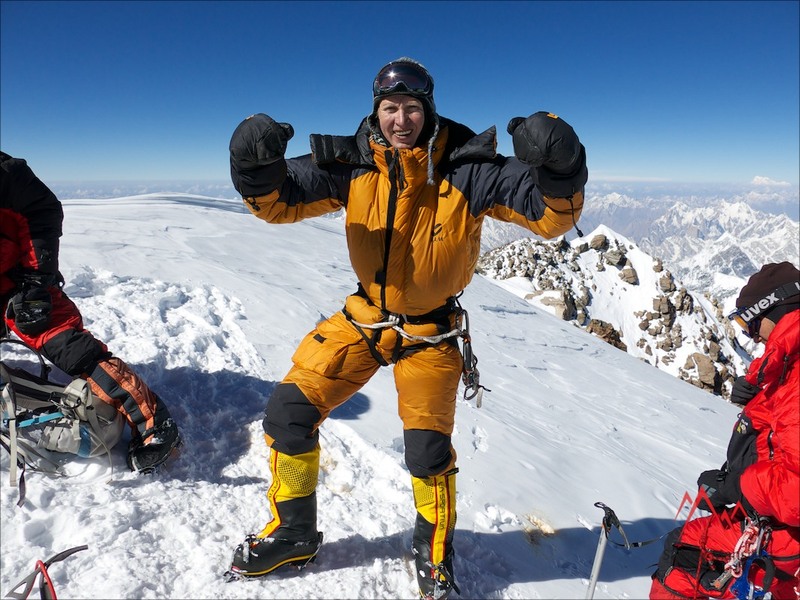 Please follow my climb on World’s 2nd tallest mountain – ”Mountain on mountains”! Greetings from K2 Basecamp! Due to new regulations regarding joining teams and permits I have ended up attempting K2 instead of Broad Peak! I have been experiencing problems with Broad Peak permit as my local operator does not have a team there this season. They would have had me joined with another company’s team which apparently is not quite as common and accepted procedure here as it is in, let’s say, Nepal. Anyway, I have today reached K2 Basecamp at 5000 meters after starting in Concordia this morning. It is very windy on Karakorum summits and on K2 right now so need to wait to start rotations up ”Mountain of mountains”. I hear the route has already been fixed up to Camp 2 (approx 6650m.) which might reflect fairly good snow conditions. 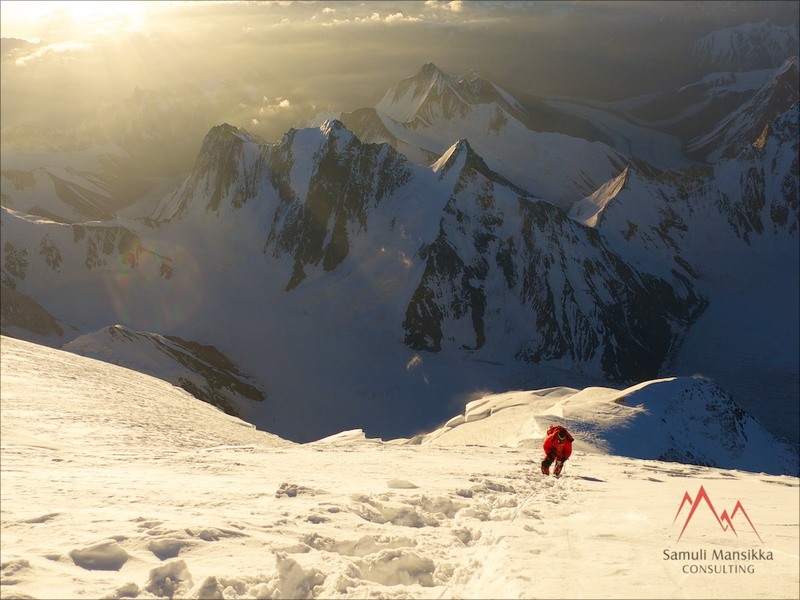 Follow my attempt on K2 on Twitter at twitter.com/Samuli_Mansikka and Instagram at instagram.com/samulimansikka! Warmest greetings from Paiju! Well, it’s beyond warm! It is boiling hot here! 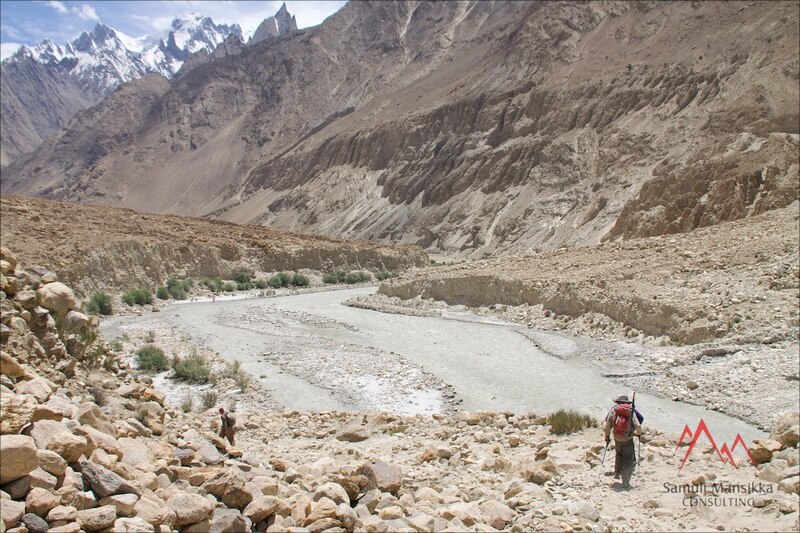 Anyway, my Broad Peak expedition is now well underway and the group I am joined with have reached our second trek camp. I am joined with an international K2 expedition and am trekking with them until K2 basecamp. I arrived in Islamabad on 25th June and were transfered overland to Skardu on 26th to 27th. On 28th all of us were driven to trailhead in Askole. I must say I greatly dislike the drive as the road is by far the scariest I ever been on. However, we got there safely and started trekking on 29th! The trek is brutal! It is complete wilderness from Askole onwards and it is hard! The trail’s not too good and all day it is extremely hot temperatures being well over 40C with no shade! But boy is this part of the World beautiful? I’ve been thinking about how I consider the European Alps as probably the most beautiful mountain range in the World but to be honest, I don’t know! I kinda had forgotten how stunning these peaks are? And we are still not even close to Concordia from where you have the most amazing mountain panorama! Tomorrow on July 2nd we’ll continue to Urdukas. We heard that the most commonly used (shortest) trail is in very bad condition and thus we will very likely be taking a longer although safer route closer to Trangos. Tomorrow we get on the Baltoro glacier and will stay on it until back in Paiju after the climb! Follow the trip through my Twitter and Instagram! 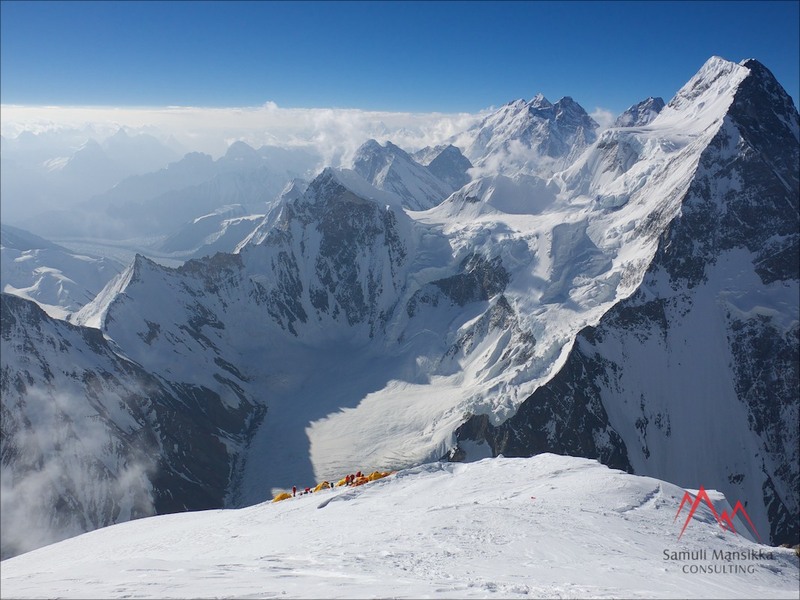 Next blog-entry from K2 basecamp!